Take a look at this altered book artist Peter Madden. Those book spines make me drool! One of those books(according to my friend who attended the lecture) is made from ROOFING Tiles. Talk about inspiring! I totally have a thing for altered books all lined up in a row. It's my goal to have a whole bookcase full of altered books. I've been picturing that bookcase in my head for a long while now. I am slowly working towards getting it in real life. Take a look at Mr. Madden's Portfolio, well, it's under construction, but there are photos of some of his work for now. There are Triptychs, Boxes and Alternative Photography. There are way too few photos posted, but just the names and what little I've seen inspires me! 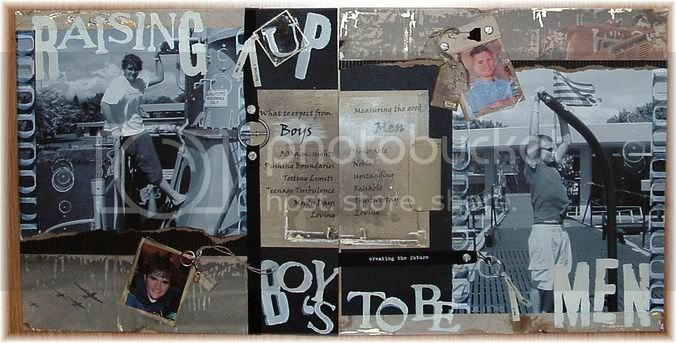 I so ready to go do some finding of my own and increase my own collection of handmade altered art! Sometimes all it takes is one word of inspiration to influence the flow of creativity. I know that by looking at all kinds of art really widens my boundaries and makes me happy as a creator of my own art. I LOVE ideas! I LOVE inspiration! Just knowing something can be done, it doesn't matter if I know how it's done, if I just know it CAN be done, I'll figure out a way to make it my own. Like those Stone Photographs! I think I can do that! So now, I've found a new hero. Thanks Peter for doing your art so well and sharing it with the world. I just wish I had found out in enough time to have attended myself. Now I've got to figure out a way to attend the upcoming lecture by Julie Leonard on Artist's Books and then I have to remember the one that's coming in September by Deborah Wender on Scrapbook Preservation.